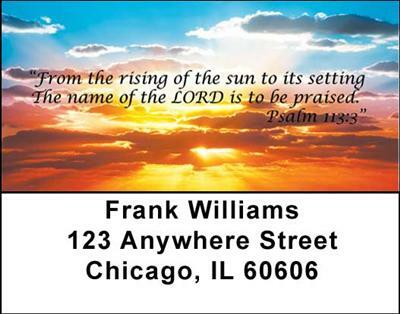 "Heavenly Psalms Address Labels" product is already in your cart. With four different gorgeous landscapes that go hand in hand with verses from the Bible these Heavenly Psalms Address Labels make a beautiful statement. The magnificent scenes include these wonderful displays: a breathtaking rainbow against a blue sky scattered with clouds, a stunning sunset, another gorgeous blue sky studded with clouds and a majestic mountain scene covered with snow. Each Bible verse on these Heavenly Psalms Address Labels corresponds beautifully with the scene giving you a dramatic and inspirational way to write your envelopes and spread God’s message of love and the outstanding landscapes that we take for granted every day.